The first and unnamed narrator is cleaning his mother’s house after she passed away and discovers the Nikolski-compass, a compass that points at Nikolski in the Aleutian islands instead of north, the only memorabilia after his father. The second narrator, Noah, has spent his whole life in a car with his mother travelling around Canada’s midwest. His father left and spent his life on the sea, and the last postcard they got from him was sent from Nikolski. Noah leaves his mother and moves to Montreal to study archaeology. Joyce Doucette, the third narrator, grows up on an island on the Atlantic coast hearing her grandfather’s tales of their ancestors who were pirates and runs away to Montreal while she’s still in high school. There she starts working in a fish shop and steals old, broken computers at night. This was for me the perfect portrait of modern Canada. The book goes from coast to coast and through generations of both natives and immigrants. So many places, facts and fiction squeezed into one small book. I loved the names of the chapters. The three narrators are all in the same small neighbourhood at the same time, will their paths cross? And will they discover that they are related? Another thing that amazed me with this book was its design (fishes!) and the print it was set in. That is one experience that you won’t get when reading an e-book. 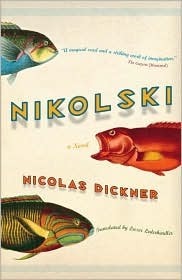 Nicolas Dickner is an author I definitely want to read more from.